Out of the heart of a legendary landscape comes a champion–The Club at Flying Horse, featuring a private 18-hole Tom Weiskopf Signature Golf Course, European resort-style Golf Clubhouse, and a World-class Athletic Club and Spa. Plus, coming soon to Flying Horse North in 2020, a brand new 18-hole Golf Course designed by Phil Smith. 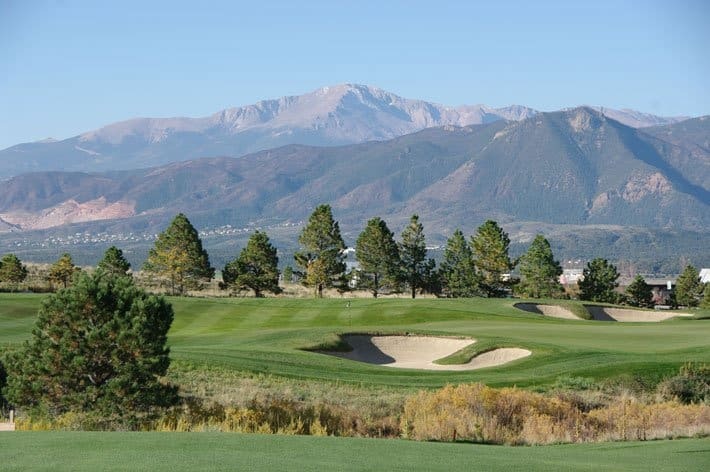 Commanding center stage in the grand landscape of Colorado Springs’ most impressive luxury community, The Club offers Members the rare opportunity to play two golf courses whose bloodlines rival those of the greatest golf courses in the World. The Flying Horse Golf Course first opened for play on August 19, 2005. Today, it continues to receive rave reviews from avid golfers, Club Members, and invited guests. Private tours of The Club and Golf Course can be scheduled by contacting The Club Membership Office at (719) 494-1222. Planning a Golf Outing or Special Event? Make your next golf event unforgettable at our Tom Weiskopf Signature Golf Course and our award winning Clubhouse. Charity, Fundraising, Corporate, and Private Golf Events. Events customized to fit your needs, we are here to help throughout the entire process. For further questions or to book an event, please call our Golf Event Planners at 719-487-2678. Become a Member of The Club at Flying Horse. Members enjoy all the honors and privileges of one (soon to be two) of the top Golf Courses in Colorado Springs, including access to the Club’s private facilities.